What would you do if your entire life took a dramatic turn for the worse in a split second? That's what happened to Max O'Brien , who suffered horrific injuries in a motorcycle accident. However, O'Brien is taking the worst moment in his life and using it as motivation for everyone who comes in contact with him. "Keep that core tight," trainer Renard Simon said as he guided O'Brien through his workout. O'Brien is at the height of his training regimen . His first physique bodybuilding contest is just days away -- not bad for a guy two years removed from a devastating accident. But there's no keeping this fighting Irishman down for long. "I've always been competitive," said O'Brien, wiping away sweat. Competitive might be an understatement for O'Brien. You might call him an adrenaline junkie. "I bought a motorcycle to kind of bring a little excitement into my life," said O'Brien, thinking back to a time in his life when he was constantly seeking an edge. It was a motorcycle ride two years ago that changed him. He said the crash changed him for the better. "We are having a pretty good ride and then we enter a turn," O'Brien said, looking off into the distance remembering that fateful day riding in the hills north of Los Angeles. "And my chain skips a sprocket and that just sent me on a straight trajectory across the highway." What happened to O'Brien next changed his life forever. The fact that he is alive today is a miracle. "A car came through and hit me and pinched my left leg between the bike and cut it right off," said O'Brien, pausing for a second. "I just remembered seeing the sky and the ground. Just tumbling around until a second car came and hit me head on." O'Brien almost lost his left arm, too. Doctors put it back together with metal plates and screws. Somehow, O'Brien finds an upside in all this. "I've been given a gift and that's a platform to make a change," O'Brien said with a smile. O'Brien's platform is the 2016 NPC San Diego Championships National Qualifier physique competition, against able-bodied competitors. Sure people will stare; they always do. But that's what O'Brien wants. It's his way to draw attention and create change. 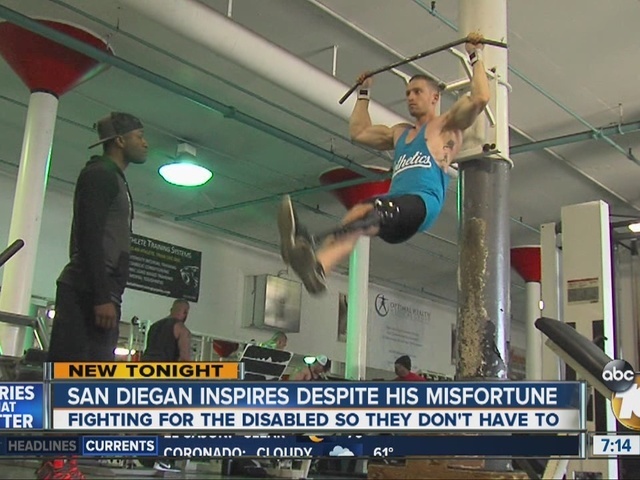 "I believe the only disability is a bad attitude," said a determined O'Brien. O'Brien didn't have insurance before his accident and was forced to leave the hospital sooner than he anticipated. After a year, he was able to receive Obamacare, but it took petition after petition to finally get the prosthetic he needed. "It's been two and a half years since my accident, and four days ago, I got the first prosthetic that actually fits well enough for me to put any sort of athleticism behind it," said O'Brien. O'Brien is trying to bring attention and fight for other disabled people so they don't have to. It's not a fight he picked, but one he wouldn't change. "If there was some surgery to put a leg back on, I wouldn't do it because it's a healthy reminder to keep pushing," O'Brien said with a huge grin. "And it's a beautiful part of who I am now. I love it." Happy St. Patrick's Day! Want to see someone with that true Irish Fighting Spirit? Just push play to learn about Max O'Brien and how he's taking the worst moment in his life and transforming it into the most inspiring moments for anyone who comes in contact with him. See Max's story tonight on 10News – ABC San Diego KGTV at 7pm.